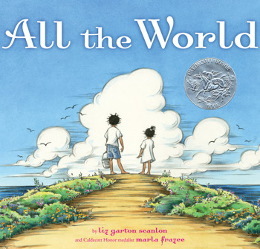 I unabashedly love this book, with its subtly hopeful message, lyrical language, and beautiful pictures. It w as a birthday gift to my younger daughter from one of her best friends at day care. I can’t remember exactly which birthday- either her 3rd or 4th- but as soon as we got the book, it entered into heavy rotation for bedtime reading. The book is a series of vignettes about “all the world.” They are simple, but sometimes have provoked a question or observation from my daughter, and together they create the image of an interconnected world, the nature of which is up to all of us. It manages to do this and feel like a warm hug, not a sappy slogan. My daughter seems to like the book as much as I do, and never complains when I pick it out as my selection for a bedtime story (on my nights to read to her, I often pick one book and let her pick the other). I’ll often pick it if I’ve had a particularly hard day, or if something bad has happened in the news. It is good for my soul in a way I can’t quite describe.